Coastal vegetation play an important role in maintaining the integrity of our dune systems – they act as a windbreak, trapping deposited sand particles and stabilising the dune system. Without vegetation, this natural protective barrier would be lost to the effects of wind and wave erosion. growing low to the ground, covering the sand and reducing the impact of high wind conditions. 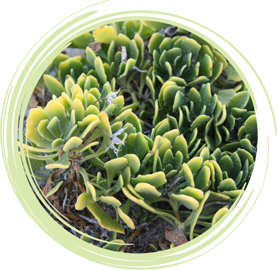 Other plants also use succulent leaves to store moisture during dry periods, and have modified leaf shapes and colours to help promote their survival in this harsh environment. Discuss the importance of dune vegetation and their adaptations with your group. If investigating the types of dune and coastal vegetation at your chosen beachcombing site, use designated footpaths to avoid trampling and disrupting the dune systems. Rippey E. & Rowland B. (2004) Coastal Plants: Perth and the South West Region. Australia: University of Western Australia. Smith G.G. (1985) A Guide to the Coastal Flora of South-Western Australia. Australia: Advanced Press Pty. Ltd.